His Beatitude Metropolitan Tikhon visited Christ the Savior from August 25-27 to: 1) raise the mission to full parish status, 2) celebrate the 90th birthday of the church's founder, Protopresbyter Daniel Hubiak, and 3) lead the annual Diocesan Day celebration. The weekend's festivities began on Friday, August 25th with the welcoming of Metropolitan Tikhon, together with family and friends of Fr. Daniel and Mat. Dunia for a dinner in their honor. 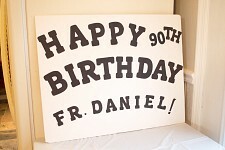 The occasion marked the 90th birthday of Fr. Daniel, which occurred some months earlier but was postponed for logistical reasons. His Beatitude conveyed the sincere best wishes and congratulations of the Holy Synod, the chancellery and the faithful of the Orthodox Church in America (OCA), of which Fr. Daniel has been a faithful priest for 60+ years, serving in numerous parishes and capacities, most notably as chancellor, treasurer, and secretary, as well as the head of the OCA representation church in Moscow. 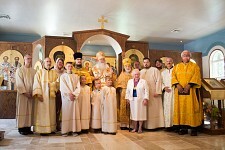 At the conclusion of the Hierarchical Divine Liturgy on Saturday, Fr. Daniel and Mat. 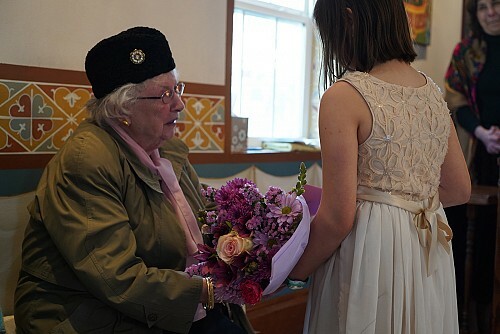 Dunia were presented with gold medals in the Order of Saint Innocent, the OCA’s highest award. Clergy and faithful from the Archdiocese of Washington gathered at Christ the Savior on Saturday, August 26th, joining those already in attendance, to celebrate their annual Diocesan Day, which provides an occasion for the unity of the Archdiocese to be concretely experienced in joyful gathering for worship, spiritual conversation, and fellowship. After the Divine Liturgy, during which Dr. Nicholas Borodulia was tonsured a Reader, attendees enjoyed a festive barbeque, an open house in the rectory, and a little relaxation in the parish pool. Following a spiritual discussion with Metropolitan Tikhon, the day concluded with the celebration of Great Vespers in the chapel. The festive and noteworthy events of the weekend continued as His Beatitude elevated the church from mission to full parish status. 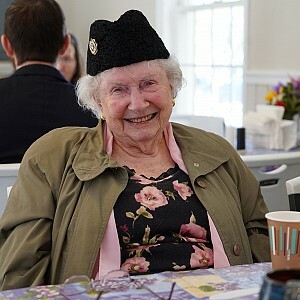 This officially marked the coming of age of the community which was established some 17 years earlier in Fenwick Island, Delaware, before relocating to Dagsboro, Delaware, and finally settling in Berlin, Maryland. The graduation, following exactly one year after the mortgage burning celebration, signified that the community had reached the necessary level of institutional maturity and stability established in the Archdiocesan guidelines for parishes to which the church aspired since its inception in 2000. His Beatitude Metropolitan Tikhon congratulated the entire community, thanking them for their efforts in service to God, and bestowed upon its rector Fr. John Parsells the privilege of wearing the gold cross. We thank all those who traveled, in some cases even great distances, to celebrate the coinciding of these joyous occasions. We also congratulate those who wished to but could not be in attendance. We thank His Beatitude, accompanied by Archdeacon Joseph Matusiak, Subdeacon Roman Ostash, and the very reverend priests and deacons, who led the divine services and festivities. We heartily wish Protopresbyter Daniel and Mat. Dunia, the members, benefactors, supporters, and all the faithful, including the newly tonsured Reader Nicholas health, strength, salvation, a furtherance in every good thing, and many blessed years! We ask the Lord to grant eternal memory and rest with the Saints to all the departed members of Christ the Savior, who have gone before us in the assurance of the resurrection. And most importantly, we bow down most deeply before Almighty God, overwhelmed by gratitude and filled with awe in the face of His majesty, providential care, and merciful kindness to us, glorifying and thanking Him for the gift of this small humble parish which bears His Holy Name and unites us to Him and one another in the joy and peace of eternal life, experienced already in this age!